Building on my observations from 17 very different European groups, I shared in an earlier post about the similarities I found in their outcomes and experiences. In this post, I focus on some of the similarities in processes and structures I found. These processes and structures support the outcomes and experiences I described in the earlier post. To support this experience of “magic,” another interesting aspect I found was they have structures and processes that allow the emergence of a balanced amount and interplay of male and female leaders/drivers. These groups are very clear that it is not the mere fact of having a quota of woman or men (this is a big topic now in Germany), rather it is much more about the kind of energy and impulse or gesture that we still attribute more to male or females, such as the suggestion that males are more dominant and polarizing and women more balancing and harmonizing. In these highly vibrant groups I have identified, those abilities and competences are both present, in the men and in the women. For me this was enlightening, since I understood that while important and crucial for the future success of Germany, part of the discussion we have in Germany is not relevant. It is not about men and woman, rather about the ability to live masculine and feminine energies at the same time. Here is the point that the experience of these high vibrancy groups make so clear: we have to differentiate between a) the fairness aspect of giving men and women the same chances, b) the competences and abilities to enact one’s feminine and masculine energies, and c) the processes and structures one needs to create a high performing social system. I also see that these groups tend to share a very strong agreement on the deeper common cause and vision/ mission. These groups have a wide variety of practices and processes to ensure that everyone can step into the shared vision and purpose. They range from massive online and offline network events, and changing focus topics every year to “simple” structures, such as selecting somebody in the company you will do something good for within a given time frame. These groups deeply value new contributions, as long as they align with their mission and vision. In this way, they are able to integrate innovations and new practices and stay focused. One particularly intriguing process is to give employees 10-20% free time to develop anything they like and contribute to the bigger idea of the company. They get the possibility to do this work together with external persons and are invited to combine efforts with other employees, to augment their time budgets. As soon as the employee or the group of employees (including the external persons) are ready to share what they have developed, they have the possibility to invite an “internal pitch meeting” to present their product or idea. Members from all levels of the organization then decide whether resources and structures will be made available. To ensure compliance with external stakeholders, top management has a veto right. I myself was just part of such a process and it is mind blowing how fast and easy it was to manifest an innovative product and integrate it into the business model of the organization. In my next post (#4 of 4), I will talk about some of the similar fundamental assumptions I find in those groups. As I shared in my last post, I have identified and studied 17 European groups to understand if and how they are living the Ecosynomic paradigm. As I reflected on what they are learning with them, starting with the basis of the “Ecosynomics Survey of Harmonic Vibrancy,” I found striking similarities in their outcomes and experiences, processes and structures, and fundamental assumptions. In this post, I will focus on the similarities I see in their outcomes and experiences. Let’s have a closer look at the case of a globally operating NGO. It provides management and leadership solutions in the field of nature conservation. Since their founding 10 years ago, most consider them the unbeaten champion in the arena. Success means that they surpass their goals, and that they are on their way to redefining management and leadership principles for nature conservation on a global scale. They are very effective, with recognized success, while very efficient at how they do it. They have been successful in responding to high demand from the big players in their field, while working with a core team of around 10 persons, scattered around the globe. About 90% of the team members took the survey. The team members describe their experience in this organization as very vibrant and harmonious, where harmonious means the balanced and constructive interplay of discordance and accordance. After analyzing the survey data, I led an in-depth reflection about the results with the whole team, starting with the graphic in Figure. It shows the average rating (A) of the different experiential dimensions, with a 5 as a high rating and a 1 as a low rating. For example, for Process of innovation, the summary values ranged from 1.74 to 5.00, averaging (A) 2.92, with a variance (V) of 1.18. The group found two interesting aspects in Figure 2. First, the variance over five of the dimensions is very low, meaning that the organization as a whole agrees very closely on them. Second, even though the group wants to be highly effective, it is still relatively weak at integrating new perspectives and at seeing value in things they still cannot see and grasp, the other two dimensions. When reflected back to them, one of them shared, “After finishing the conversation on our ability to integrate new aspects into our organization, we are still not at a final point. But, a) we all started to agree that we are facing a challenge, and b) we identified some of the major roadblocks that we have to get out of the way. We never had such a focused conversation about the elephant in the room.” As they worked further with this insight, they realized that their own success makes it difficult for them to integrate new perspectives. Meaning, because they are so convinced that their practices, processes, business solutions and value propositions are cutting edge, they forget to lift up their heads and look for new possibilities. This insight was striking to them: they saw that their competitive advantage might vanish very fast if others were to develop similar products. What strikes me in this case study is that they are aware of their success and that they are different from the status quo. Regardless of perceiving themselves as positive outliers, they are very humble in living into this. They keep a high level of openness to change and constructive input, which is a pattern I found in all of the groups until now. I will dive into those patterns in subsequent posts. Another aspect that intrigues me, in this case, is that all of them agree and openly speak about the following sentence: “We agree that our ‘magic’ makes us special and successful.” It was interesting to witness that after our workshop they still believed in this phrase but had concrete words and a concept that explained their “magic” to them. They understood that their “magic” is sustained by the agreements they live that are based in abundance rather than scarcity. The dialog made it tangible, enabling them to sustain and multiply it in a conscious way. In my next blog post (#3 of 4), I will share some of my findings on similar processes and structures found in the 17 European groups living into the Ecosynomic paradigm. In this series of 4 posts, I will share initial insights from research with 17 groups in Europe. 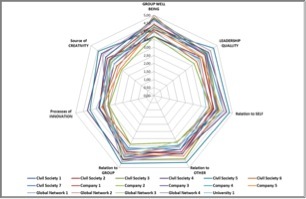 Covering seemingly different sectors (5 in business, 7 in civil society, 4 in global networks, 1 in academia), I find similar underlying patterns, innovations and dynamics in all of them. 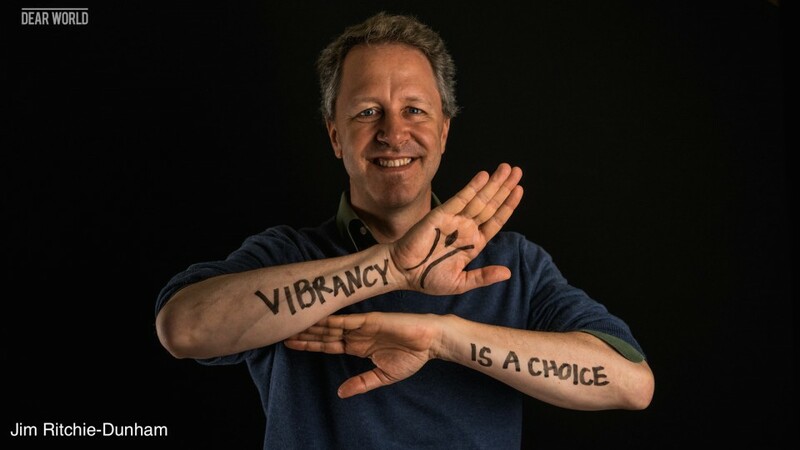 My main diagnostic tool was the “Ecosynomics Survey of Harmonic Vibrancy” from the Institute for Strategic Clarity. I was able to follow up on the survey with some of the groups, interviewing individuals, observing group processes, and offering workshops with selected members. To protect their confidentiality, I changed the names of the groups. While they are not all high-vibrancy groups, they all present interesting insights from an Ecosynomic perspective. 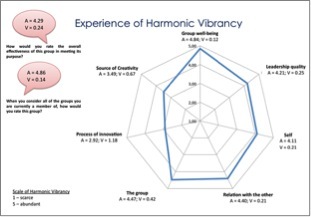 Figure 1 shows the general level of perceived Harmonic Vibrancy in each of the 17 different groups, using a scale of 1 to 5 for seven dimensions – the five primary relationships, the quality of leadership, and the group’s overall outcomes (group well-being). These ratings are outputs from the 57-item Ecosynomics Survey of Harmonic Vibrancy, which you can take for free online. As captured in Figure 1, some of the groups describe their reality as very vibrant and collaborative (depicted by the outer lines). Others describe their reality as more scarce and competitive (depicted by the inner lines). While the results might seem very similar, since the lines are all very close and no group has very low levels of harmonic vibrancy, the practices, agreements, and outcomes are very different between low and high vibrancy groups. While the groups come from different sectors and cultures, they describe similar experiences and outcomes in their work. When describing experiences of low harmonic vibrancy, the group members showed how the outcomes of their value-creation processes mostly met the industry standards. And, when describing experiences of high levels of harmonic vibrancy, they showed how their value-creation processes led to outcomes that exceeded industry standards. I started to find and identify reoccurring practices in groups describing similar levels of harmonic vibrancy. They range from having a radically different understanding of recruiting to innovative ways of organizing to letting go of standard leadership models, as well as structures that engage customers and employees at a very high rate. Finally, I found that groups with higher levels of harmonic vibrancy start their interactions from a different set of fundamental assumptions. A friend and colleague of mine just teased me and said, “So do you propose that they are better or more advanced human beings? You know you should be careful with such an assumption, especially in the German context.” No, I am not proposing that. What I observe is that they are ordinary people, like you and me, doing very ordinary things – like writing project proposals to get funding. And, I observed that they start from assumptions of possibility and abundance rather than from scarcity and limitation. I will frame each of these three insights and illustrate them with one of these cases in my subsequent blog posts. It has always been hard for me to believe that the current and predominant mode of human interaction – based in fear, distrust and competition – is the only way it works. This is what I was told by my teachers in grade school, my social-economic professors in university, and my bosses in most of the places I worked. The answer to my questions, were always some form of, “This is just the way it works. Human beings are hardwired to compete. Look around Christoph. Any socio-political system believes in the economic ideology… so it cannot be wrong. And by the way… you do not have an alternative either.” That was right; I could neither see nor come up with an alternative. I could not see beyond my own limitations. I was raised in the economic ideology and I was unable to transcend neither my mental model nor the agreements I was taught. So I started to look for answers, and I found Ecosynomics. I now know that my “crazy visions” of agreements based in collaboration, trust and interdependency are possible and being lived in thousands of groups organized in many different ways, on a daily basis. It is thrilling and fascinating to find that they are ordinary people, doing ordinary things in a completely different way. 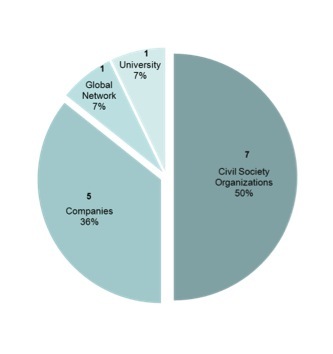 In the last year, I have visited with 14 of these groups in three different European countries, spanning from study programs in academia to global networks, civil society organizations and companies [see the pie chart below]. In this blog post, I provide a general overview of my work. In future posts, I will dive into specific cases, sharing the practices and agreements – based in abundance – that lead to their extraordinary levels of performance. Have you heard expressions like these? Do you think you are a dreamer? Christoph Hinske is an ISC Fellow, leading ISC’s work in Europe. He is the author of “Core Resources of Paradigm-Change Facilitation,” published recently in The Systems Thinker. He is also a consultant at IFOK. He lives with his extraordinary wife and daughter in the beauty of a forest outside a small village in Germany.